Online shopping in India has gone through a sea change in the last few years. With more and more people opting to buy goods from the internet, However, popular e-commerce websites are known to make bizarre sales from time to time that confuses buyers. 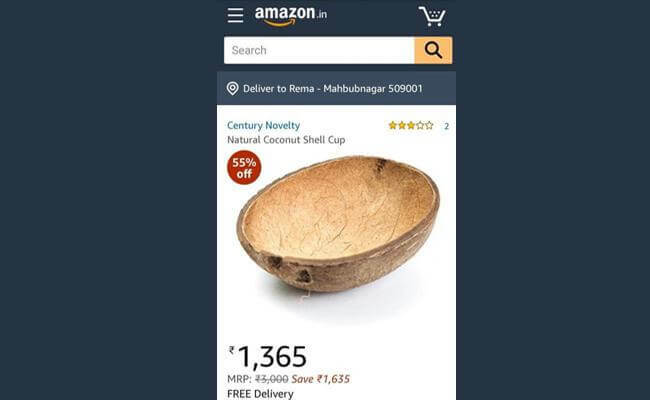 Amazon Selling Natural Coconut Shell Cup For Rs. 1,200. Indians were recently “shell-shocked” to discover that the humble coconut shell is being sold on e-commerce website Amazon for nearly Rs. 1,300. “This is an actual, real, coconut. Therefore, it may have cracks, dents, and imperfections,” reads the product description. Rebranded as “Natural coconut shell cups“, these shells start at Rs. 1,289 and can even go up to Rs. 2,499!